The latest edition of the bi-annual Africa’s Pulse report was released by the World Bank during the 2017 IMF-World Bank Annual Meetings last week. The report projects that economic growth in sub-Saharan Africa—led by the region’s largest economies—South Africa, Nigeria, and Angola—should rise to 2.4 percent in 2017, close to the 2.6 percent projection released by the International Monetary Fund and rebounding from the 1.3 percent growth seen in 2016. Beyond the short-term economic projections, a section of the report focuses on skills development in sub-Saharan Africa. Figure 3.3 shows the percentage of firms in various countries that rate finding a skilled workforce as the most binding constraint to their business. Firms with 20 or more employees, a group associated with generating employment in developing economies feel the constraint most strongly. A recent School-to-Work Transition survey of small and large firms in Benin, Liberia, Malawi, and Zambia highlighted in the report found that technical, interpersonal and higher-order cognitive skills in employees were critically important to more than half the firms. This tandem of increasing skills requirements and rising constraints for firms points to a misalignment in schooling and training programs, according to the report. One reason for the constraints stems from weaknesses in the education system. According to the report, technical and vocational education and training (TVET), along with other higher educational programs, have been challenged by poor links to labor demand and sub-optimal service delivery. 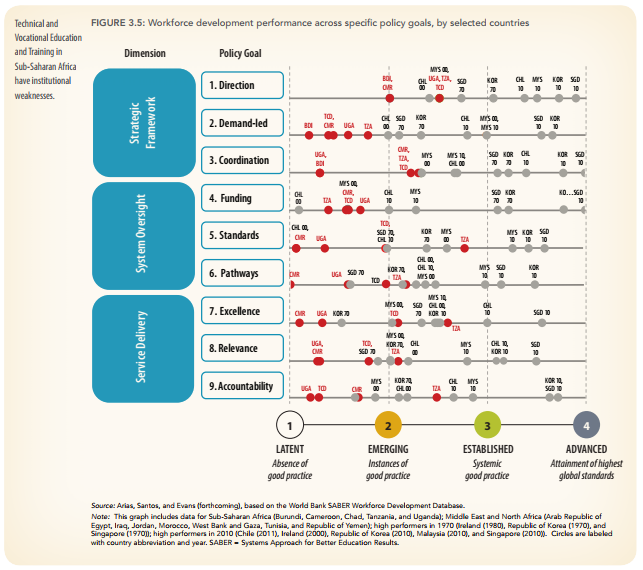 Figure 3.5 shows a few countries in the region (Burundi, Cameroon, Chad, Tanzania, and Uganda) assessed in an internationally comparable review of workforce development programs. Every country except Tanzania does poorly across almost every policy goal, highlighting the broad weaknesses in the higher educational system of those countries. Weaknesses in higher education programs impact outcomes for individuals passing through these institutions. As seen in Figure 3.4, a study based on recent household surveys in Kenya and Ghana finds significant differences in returns to schooling within and across educational programs. 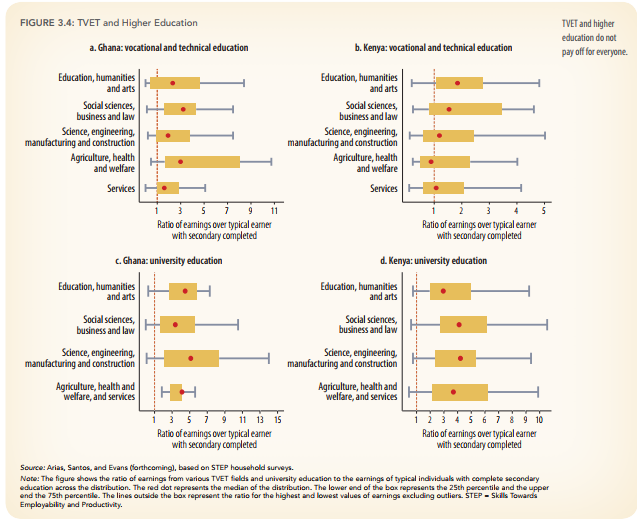 Median returns to schooling in a number of vocational and technical education programs in Kenya barely exceed the typical earning of those with secondary school degrees, highlighting a mismatch in labor demand and the number of students pursuing these degrees. More positively, returns on university education for most fields both in Ghana and Kenya are 3-5 times higher than those with just a secondary school education. The report provides several policy recommendations to improve skills programs and better align them with labor demand. It suggests country-tailored skills investments combined with policy reforms for the most conducive environment for the investments to pay off. Second, it recommends prioritization of achieving universal foundational skills and supporting youth and adults who have missed these targets. Finally, it recommends several measures to align skills programs with the labor market, such as market-driven TVET programs, a focus on meeting labor demand and skills requirements of growing sectors of the economy, on-the-job training, and entrepreneurship support.